This is how a Coptic Metropolitan described the reconciliation brought about by His Holiness Aram I (Catholicos of the Holy See of Cilicia of the Armenian Apostolic Church) between the Coptic Orthodox and the Ethiopian Orthodox Churches. “This is a historical day”, said an Ethiopian Archbishop. These words were pronounced after the signing of a Common Declaration, marking the end of more than two decades of tension between the Coptic Orthodox Church and the Ethiopian Orthodox Church. 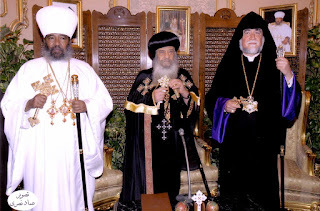 The Common Declaration was signed on Friday 13 July 2007 at the Cathedral of the Coptic Church in Cairo, with the signing of a Common Declaration by the three spiritual heads: His Holiness Shenouda III, Pope of Alexandria and Patriarch of the See of St. Mark, His Holiness Aram I, Catholicos of the Great House of Cilicia, and His Holiness Abba Paulos, Patriarch of the Ethiopian Orthodox Church. The meeting in Cairo was preceded by another meeting in Addis Ababa between Catholicos Aram I and Patriarch Paulos. In their Joint Declaration they stressed the need to strengthen the cooperation between the Oriental Orthodox Churches in the area of Christian education, theological formation, justice and peace. They called for “the recognition of the Armenian Genocide by the International Community as the first genocide of the 20th Century just as they recognized the Rwandan Genocide as the last genocide of the 20th Century”. Commenting on the role of the Oriental Orthodox Churches His Holiness Aram I, the former Moderator of the World Council of Churches said: “Unity must be translated into a quality of life undergirded by close collaboration, joint action and common vision. The churches are the limbs of the one body of Christ; they can not live in isolation; they are interrelated”. He then continued “The Oriental Orthodox Churches with their theology, spirituality and long history of martyrdom and witness have a unique contribution to make to the Christian self-understanding and mission in a new world context” and to the ecumenical movement”. no comment on your stupid article we konw who you are GEMATAM banda.